San Francisco Giants manager Bruce Bochy said he will have some tough decisions regarding the opening day roster. Bochy’s decision became slightly easier Friday, when the Giants traded infielder Conor Gillaspie to the White Sox. The Giants received pitcher Jeff Soptic, a 21-year-old hard thrower who has battled with his control. Gillaspie, a 2008 sandwich pick (37th overall), was one of five players on the Giants’ 40-man roster who were out of options, meaning he could not be sent to minors this season without first being sent through waivers. Gillaspie, who was part of the Giants’ draft class that included Buster Posey and Brandon Crawford, hit .287 with 37 HRs in five minor-league seasons in the Giants’ system. 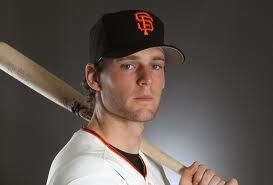 Gillaspie got a call-up last season when Pablo Sandoval went on the DL. Gillaspie went 3 for 20 (.150) in six games before being sent back to Fresno. What worked against Gillaspie was that he was not versatile defensively. He was a third baseman, and was not going to pass Sandoval and Joaquin Arias on the depth chart. Even Marco Scutaro is an option at third base. Gillaspie said he was thankful for the trade and hoped to have a better chance making the White Sox roster. The move leaves the Giants with four players who are out of options: outfielder Gregor Blanco, infielder Arias, reliever Jose Mijares and pitcher Yusmeiro Petit. Blanco, Arias and Mijares are practically guaranteed of making the 25-man roster. That leaves Petit, which will leave the Giants with an interesting decision. 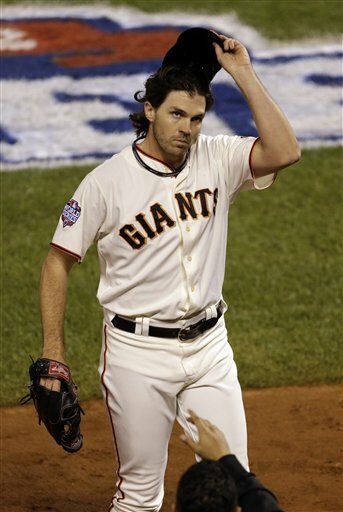 One thing the Giants are lacking are big-league ready starting pitchers beyond their starting five of Matt Cain, Madison Bumgarner, Tim Lincecum, Barry Zito and Ryan Vogelsong. Last season, all five made at least 31 starters, making the Giants the only team to have five pitchers make at least 30 starts. Only twice did the Giants need an additional starter, when a doubleheader in May in New York forced the Giants to call up Eric Hacker to make a spot start against the Padres, and in September when Petit made a start after the Giants’ clinched the division title and Bochy rested his starters. Hacker was designated for assignment in September and signed to play in Korea this winter. Of the seven pitchers who made at least seven starters for Triple-A Fresno last season, only two are in camp this spring — Petit and Boof Bonser. Petit went 7-7 with 3.46 ERA in a team-high 28 starts for Fresno. If the Giants keep Petit, it will need to be as a long reliever. It would also mean the Giants would likely release non-roster invitees like Ramon Ramirez, Chad Gaudin and Scott Proctor. Or it could mean George Kontos, who pitched well for the Giants after his call-up last season, would be sent to Fresno, for the sole reason that he CAN be sent to Fresno. If they lose Petit to trade or waivers, the top option to make a spot start could be Gaudin. Gaudin made 34 starts for the A’s in 2007, but he has not started a game since making 25 starts in 2009 for the Padres and Yankees. Chris Heston, who had a solid season for Double-A Richmond, could be first in line to get a call from Fresno. Ken Rosenthal of Fox Sports and the MLB Network said that no team since the adoption of the five-man rotation in the early 1970s has ever had five pitchers make at least 30 starts in consecutive seasons. You remember the 2010 season when Buster Posey and the Braves’ Jason Heyward were hooked in a heated battle for the NL rookie-of-the-year award? Posey went on to take the honor. In 2011, Heyward struggled through a sophomore slump, while Posey had his second season ended in May with a disastrous ankle injury. In 2012, we all know Posey returned to start the All-Star game and went on to win the NL MVP. But Heyward wasn’t all that bad. He hit .265 with 27 home runs. Well on Friday, when teams were scheduled to exchange arbitration numbers, Posey and Heyward both settled on one-year deals with their teams during their first go-round in arbitration. Posey agreed to an $8 million deal. Heyward signed for $3.65 million. It’s clear that Posey deserved to get more than Hayward. But more than twice as much? It makes you wonder how much Posey would have cost to sign this season if he didn’t miss most of the 2011 season. MoreSplashHits projected Posey would get about $5.9 million in his first year. So the $8 million deal the Giants agreed to must have meant that Posey was prepared to ask for as much as $10 million in arbitration. It also shows the need to get Posey signed to longer deal. He has three more years of arbitration after this year, meaning he could be looking at salaries of $12 million, $16 million and $20 million-plus in the coming years. 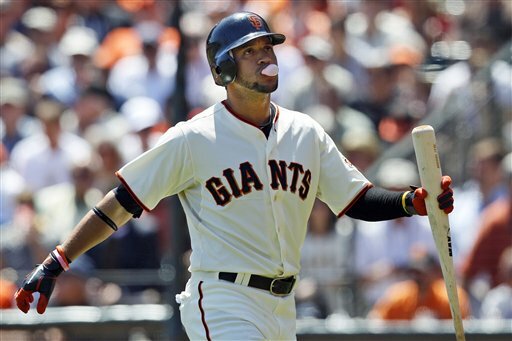 The Giants also agreed to contracts with reliever Jose Mijares and outfielder Hunter Pence, Gregor Blanco. Blanco signed for $1.35 million, which is just slightly higher than the $1.3 million figure MoreSplashHits projected. Mijares signed for $1.8 million, again higher than the $1.6 million MoreSplashHits projected. Pence agreed to $13.8 million, which was spot on with what MoreSplashHits projected. The Giants haven’t gone all the way through the arbitration process with a player in several years, and it seems unlikely that they will allow any negotiation go to the arbitrators this year. Coming off a World Series championship that was won as much with team chemistry as talent, the Giants likely were willing to pay a little more to keep harmony in the clubhouse. 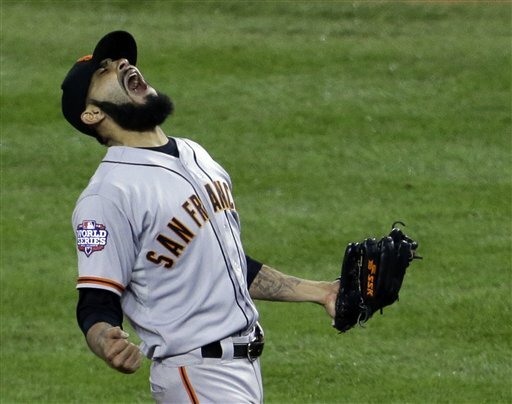 Friday’s deal leave the Giants with two unsigned arbitration-eligible players: reliever Sergio Romo (projected at $3.6 million) and infielder Joaquin Arias (projected at $800,00). OK, so the schedule should help the Giants succeed without Melky Cabrera. And having Pablo Sandoval back should help, too. What else? 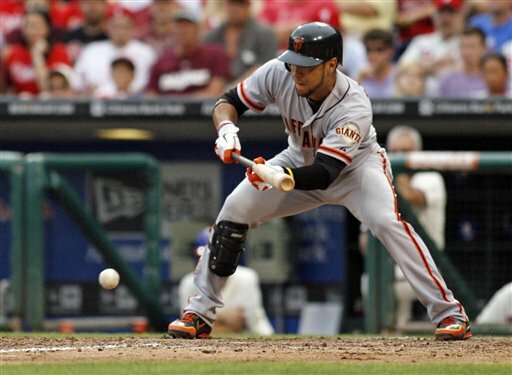 How about a new-and-improved Gregor Blanco? More accurately, the Blanco from the first part of the season. Having been unable to make anything happen on the trade front, the Giants said that Blanco will be their man to replace Cabrera in left field. So if Blanco is going to play, if he can mirror his production from early in the season — and not recent play that dropped his average to .236 — that would be big lift in lineup. Blanco was the star of spring training for the Giants, earning a spot on the roster as a reserve outfielder. His strong play eventually forced his way into the lineup, displacing Nate Schierholtz in right field. He hit .315 in May (29 for 92). But he dropped to .218 in June (24 for 110). He was better in the first half of the month (.255) than he was in the second half (.182). 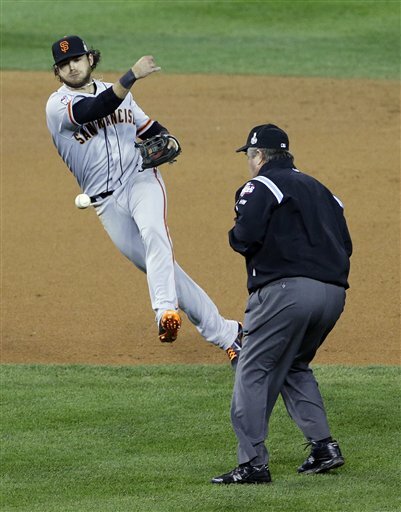 He slipped even further in July, .197 (12 for 61), eventually losing starts first to Schierholtz then to Hunter Pence. Is there an explanation for Blanco’s drop-off? Injuries limited Blanco to 74 games in the minors in 2011. But he played about 80 games in the Venezuelan Winter League from October to January, being named the league MVP. He then played 27 games during spring training as he battled for a job with the club. Add in the 100 games he’s played with the Giants, and that’s more than 200 games over the past 10 months. That’s a lot of games for a journeyman player who spent much of the past few years between being at Triple-A player and a reserve big leaguer who saw limited action. It could explain Blanco’s drop-off. 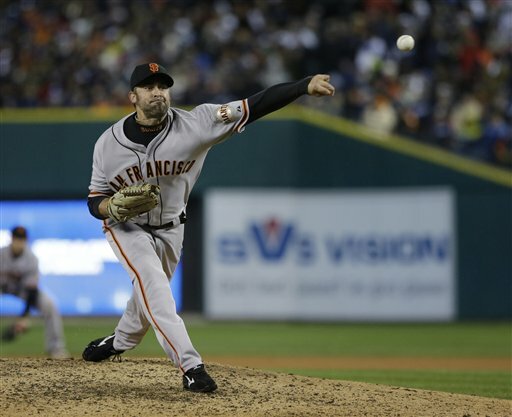 But prior to Wednesday, Blanco started just four of the Giants’ previous 22 games. That respite may be just what Blanco needed to revitalize his body and clear his mind. After making his first start Wednesday since Aug. 1, Blanco ended 0-for-21 stretch by going 2 for 4 against the Nationals. On Friday in San Diego, he followed that up with another 2-for-4 game. Prior to the past two games, Blanco hadn’t had a mult-hit game since July 7. If Blanco can be more productive, limit his strikeouts and use his speed, it could help soften the loss of Cabrera. The Giants did something Wednesday that they haven’t been able to do since May 27 in Miami. They hit a home run. 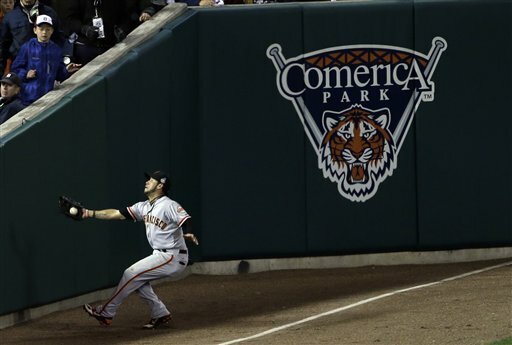 And it came off the potent bat of Gregor Blanco. Blanco’s blast not only helped the Giants win for the seventh time in nine games — nine games with just one home run — it moved the Giants out of a 29th-place tie for home runs by a team in the majors. It was the Giants’ 32nd home run of the season, one ahead of the Padres. In fact, if the Giants were to hit eight home runs in Thursday’s game, they would still rank 29th in the majors in home runs. 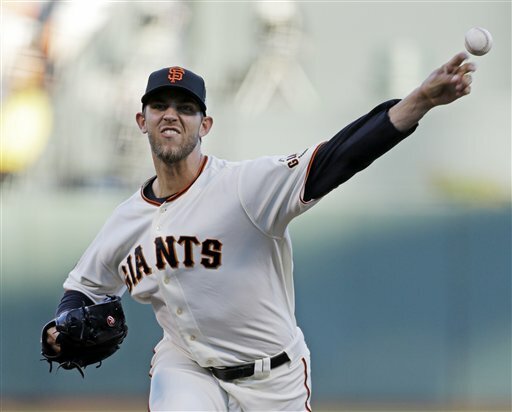 One of the Bay Area scribe’s recently wrote that the Giants cannot expect to keep up their winning ways with such little power productions. But the Giants are finding other ways to score runs and win games. Besides hitting just one home run in the past nine games, the Giants also have only one of another stat: Errors. That’s right. Even though the Giants rank first in the National League with 51 errors (only second in the majors behind the Orioles’ 52), they have only committed one error in the past nine games. They are on a six-game errorless streak. They have not committed an error by an infielder since May 26, and have not had a multi-error game since May 23, the last time shortstop Brandon Crawford committed an error. It addition to good glove work, the Giants have been good with the bats in other ways. Their 506 hits ranks fifth in the majors and third in the NL behind the Cardinals and Phillies. Their 22 triples leads the majors. And even though they don’t hit fly balls over the fence, they hit them deep enough score runs. Their 23 sacrifice flies is tied for the major league lead with the Red Sox. On Wednesday, the Giants knocked out 11 hits. Every positions player had at least one, with Blanco, Melky Cabrera and Brett Pill (he really need that) having two-hit games. Buster Posey lifted his team-high five sacrifice fly. So the Giants are showing that good pitching, hitting and defense is good enough to win … at least against the Padres, Cubs and Diamondbacks. Doing that against the Rangers may be a different story. Matt Cain takes the hill against Jason Marquis in a 12:35 p.m. game on Thursday. Giants manager Bruce Bochy said Aubrey Huff was getting closer to start. Well, not with Gregor Blanco around. Blanco went 3 for 4 Monday, with two hits that didn’t leave the infield and one hit that left the yard. Blanco’s solo shot to right in the sixth — and it was no cheapy — got the Giants on the board, and his infield single to leadoff the eighth sparked a two-run rally. “I was trying to hit a line drive through the middle and it worked out better,” Blanco said of his home run. It led to happy ending that didn’t look evident when things started — nor the way it ended. The Giants could not figure out Colorado rookie left-hander Christian Friedrich early on. The Giants, who have the fewest strikeouts in the NL, whiffed six times their first time through the lineup. Blanco’s first infield single to lead off the fourth would be the team’s first hit. They would finish with 10. In the ninth, after RBI singles by Buster Posey and Brett Pill in the eighth gave the Giants a 3-1 lead, the Rockies put two runners on with one out against Santiago Casilla. Casilla looked to get out of the inning when Marco Scutaro hit a hard grounder third baseman Joaquin Arias, setting up a potential game-inning double play. Instead, Arias let it get by him for an error, allowing the Rockies to cut the margin to 3-1 and put runners on second and third with one out. But Casilla struck out Dexter Fowler, and after an intentional walk to Carlos Gonzalez, Arias redeemed himself by making a nice play on a slow chopper by Chris Nelson to end the game. 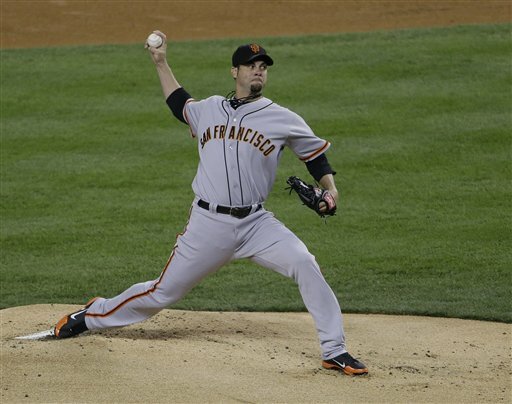 P Ryan Vogelsong regrouped from a rough start when he struggled with his control. He walked five, but finished seven innings by giving up one run on three hits. 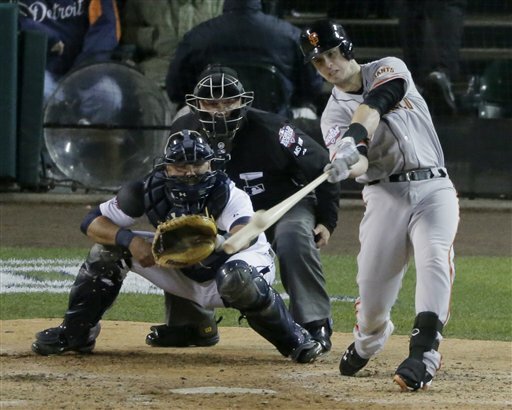 C Buster Posey went 2 for 4 as he tried to break out of a recent slump. An interesting late move. 2B Charlie Culberson was replaced in the ninth by 2B Emmanuel Burriss, we presume for defensive purposes. Tim Lincecum returns to the mound at 7:10 p.m. Tuesday to face Jeremy Guthrie, who will make his first since coming off the DL. 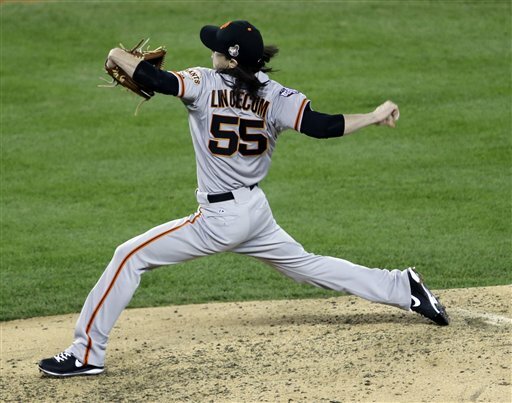 Lincecum may face a Troy Tulowitzki-less lineup. Tulowitzki injured his ankle when he was hit by a foul ball by teammate while sitting in the dugout. Tulowitzki tried to continue but was eventually pulled for a pinch-runner. We’d be surprise to see him in the lineup Tuesday.